With going back to work, things have been pretty hectic around here. 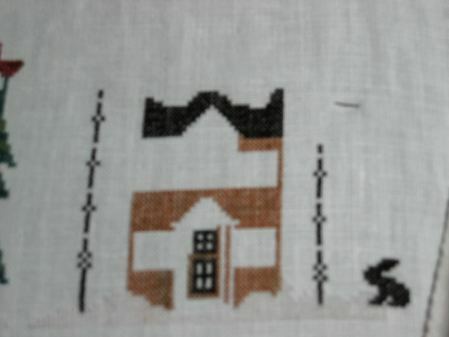 It is going well, but I am having a bit of difficulty motivating myself to stitch at the end of the day once Nathaniel is in bed. It is getting better though. I have adjusted to work more easily than I thought. I think sending Nathaniel to daycare a week early really helped since I was starting to get comfortable with the staff and being away from him once my first day rolled around. So far I have been very pleased with the daycare. All the staff is very affectionate with him and he comes home tired but happy at the end of the day. The teacher also noted that he does well with tummy time for her, which he hates at home. I think it is because several babies are put on the floor at the same time and he likes to look at them. I think that is what makes it tolerable for him. Nathaniel is also giggling a good bit now. I have some video I am trying to edit so hopefully I’ll be able to share soon. It is a fun sound! Ooooo! Bine is going to LOVE her RR!!! I’m glad to hear that you’re adjusting to being back at work pretty well. It’s good that you are comfortable with the daycare staff and confident that Nathaniel is receiving good care. The stitching will come in time. Take it easy!